Yet another of our proofreading projects has been completed. This week’s offering is The Shadow of a Sin by Charlotte M. Brame (alias Bertha M. Clay), a dime novel romance examining (in high melodramatic form) the long-term consequences of a single impulsive action. This book is considerably more sedate than our previous romantic offering, Mrs. Alex. McVeigh Miller’s The Bride of the Tomb; and, Queenie’s Terrible Secret. While Mrs. Miller’s stories are filled with dramatic incident and sudden violence, Brame’s are considerably calmer, concerning themselves more with British society and emotional misunderstandings than with kidnappings and fiendish conspiracies. 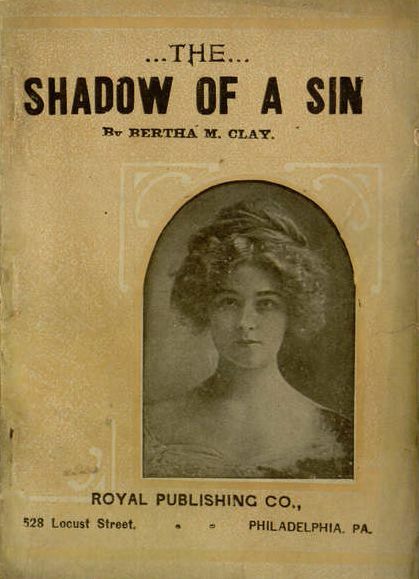 That is not to say that there is no drama here or that Brame’s heroine suffers less than Millers’; however, The Shadow of a Sin is less likely than The Bride of the Tomb to shatter preconceptions about 19th century popular fiction. The book can be read online or downloaded in a variety of popular e-reader formats at Project Gutenberg, which also has a variety of other works by Brame. To learn more about the book and its author, see our previous post about this project.